Holi celebration at Sri Radha Krishna Temple, Spanish Fork, Utah, Unitit States. 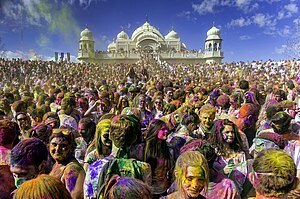 Holi (pronunciation: /ˈhoʊliː/; Sanskrit: होली Holī) is a ware festival, an aa kent as the festival o colours or the festival o love. It is an auncient Hindu releegious festival which haes acome popular wi non-Hindus in mony pairts o Sooth Asie, as well as fowk o ither commonties ootside Asie. This page wis last eeditit on 27 Mairch 2017, at 21:37.